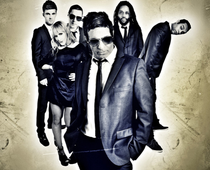 Dub Pistols recently unveiled their new video for ‘Alive’. The single is one half of their their new AA single ‘Alive/ Mucky Weekend, which is out through Sunday Best Recordings. The single is taken from their new album, ‘Worshipping The Dollar’, which is out this Monday 2nd July, also through Sunday Best. The video is a special fan made video, where fan-sent Instagram photos and live footage are combined. Dub Pistols are asking their fans - can you spot your photo? Check it out below and see.